Owners Azizi Tookas and Chris Sunde’s first venture, Brandywine Gardens, began back in 2005 as specialty heirloom tomato growers. They started Brandywine Kitchen at the Bellingham Farmers Market, serving up local fare using their tomatoes and products from other local farmers. What started as a side hobby slowly transitioned into a full blow business: Brandywine Kitchen. In 2011 they purchased and moved into their current home on Commercial Street. Chris & Azizi say that “From seed to plate is a motto that encompasses both our history as food producers and our belief that supporting local food systems leads to a superior product.” The long list of local farms, artisans, and producers they work can be found on their storied brick wall as you order. “Brandywine has been buying local from the beginning. From their tasty beginnings at the Bellingham Farmers Market, growing their own tomatoes, to supporting many local farmers and food businesses today. 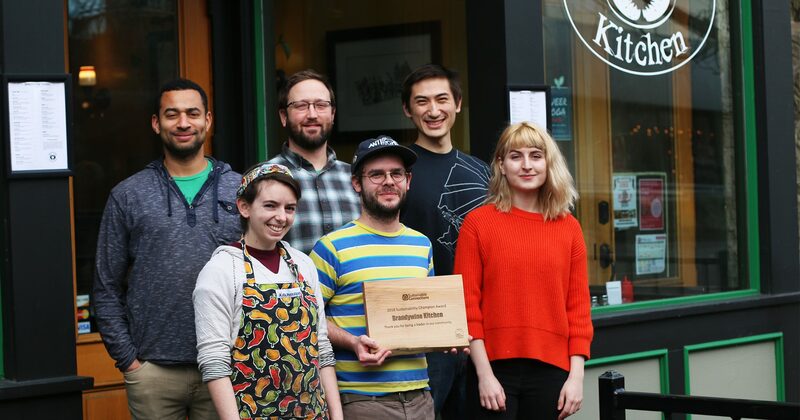 It’s exciting to see how this business has grown to be a staple of the downtown restaurant community and continued their commitment to support local farms and food,” says Sustainable Connections Food & Farming Director Sara Southerland. They have been part of the Eat Local First Campaign since 2011 and are sourcing an average of 35% of their restaurant’s food budget from local farmers and food producers (which is a lot compared to many!). Over the years they’ve grown valuable partnerships with many non-profits, provide a valuable meeting space for citizens and organizations on their mezzanine level, and they’ve collaborated on events like the Commercial Street Nigh Market, Downtown Art Walk, and much more. Down to their very roots, they are an invaluable part of our local restaurant scene and food community.